Get your basic cookie recipe right and the world is your oyster. You can add any flavour combinations you like and nine times out ten (I can't guarantee pickle and lemon cookies are going to taste nice) you will have a batch of delicious, crunchy on the outside, soft in the middle cookies. 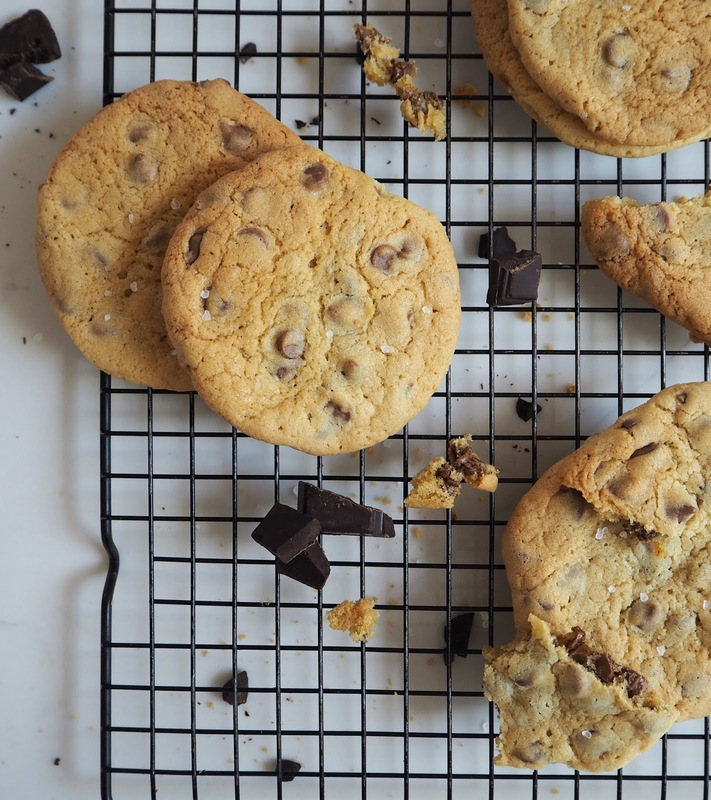 I've done the hard work for you and have tried and tested countless different recipes, combinations and ingredients to bring you the ultimate cookie recipe. I baked these with my favourite flavour, mint choc chip, which only enhanced this already perfect batch of cookies. Beat the butter and sugars in a mixing bowl until light and fluffy. Add the egg and vanilla and beat until combined. In a small mixing bowl combined the flour, salt and bicarbonate of soda. Pour into the butter/sugar mixture and beat until the mixture becomes a smooth dough. Using a wooden spoon stir in the chocolate until evenly distributed. Roll the dough into 12 equal balls, place on a plate and chill in the fridge for 1 hour. Space the cookie dough balls out on the baking trays and bake for 15 minutes until just turning golden brown. They will still be soft to touch but will firm up once cooled. Cool completely on the baking tray, scatter with sea salt flakes and serve.